I've raved about the fabulous nature of Tokyo Disney Sea's Fortress Explorations time and time again, but the one thing that's always kind of bugged me is why it's classified as part of the Mediterranean Harbor on the park map. On one hand, the theming is the obvious answer. It is a Renaissance fortress with Italian overtones, matching the theme of Disney Sea's entrance area. But on the other hand, geographically, it is literally part of Mysterious Island. It is on the same central land mass of the park. 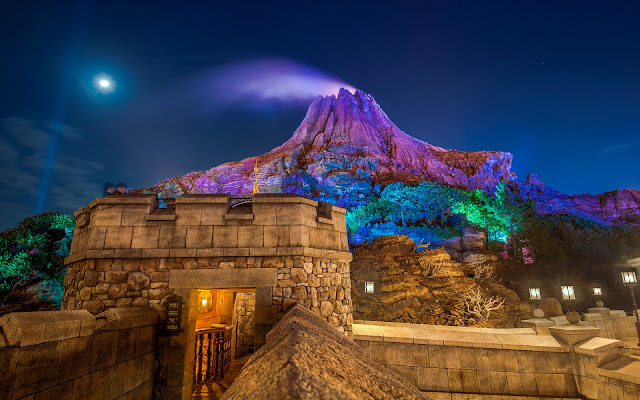 Of course, one does not truly enter Mysterious Island until crossing through a tunnel and into the caldera side, but still, location-wise, on a map, it encompasses Fortress Explorations. That's about the closest thing I can say to a negative for the most beautiful theme park in the world. And when that's the case, you know the theme park is truly a "Sea of Dreams!" Mount Prometheus looms closely over Fortress Explorations at night.